I was with my friends Jon and Nelly for a short weekend getaway in White Sands Beach Resort courtesy of Pakalista Berg. Why he wasn’t able to join us is another story. How did we end up eating at Da Vinci’s? Was it our first choice? Definitely not. This is another edition of “We can’t afford SUTIKIL“. We would have eaten at Tong’s in Mactan Marina Mall but it was closed. So Da Vinci, the master pizza man, saved the day. Double layer of mozzarella cheese topped with lots of mushrooms. Blends perfectly with Da Vinci’s very own red tomato sauce. It’s no surprise that we ordered something non-meat or vegetarian because Jon was with us. 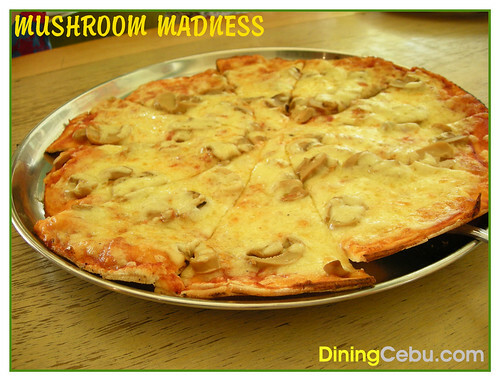 We all loved the Da Vinci’s Mushroom Madness pizza because the crust is very thin and it’s loaded with lots of mozzarella cheese and button mushrooms. I had a slight grumble though on its bland taste. But Jon pointed out that its normal for a mozzarella cheese. 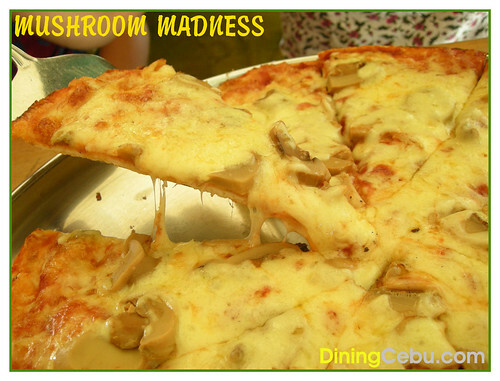 Da Vinci’s Mushroom Madness is definitely a classic mushroom and cheese pizza. Italian sausage, beef, pepperoni, fresh tomatoes, mushrooms and mozzarella cheese. Blends incredibly perfect with Da Vinci’s famous white sauce. Ordering the Da Vinci’s Masterpiece pizza was a no-brainer because it’s Da Vinci’s specialty white sauce pizza. After Jon took a bite of Da Vinci’s Masterpiece pizza (without the meat of course! ), he immediately blurted out that I will love it. I prefer this over the Mushroom Madness pizza because it was seasoned the way I like it. A bit salty. You’ll love the Da Vinci’s Masterpiece pizza because it is loaded with generous amounts of beef, sausages, and pepperoni, and mozzarella cheese. I have to stress though that I couldn’t distinguish the difference between the white sauce and tomato sauce pizza except for the obvious color. 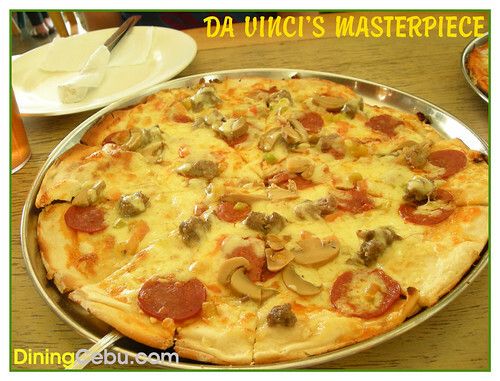 For me Da Vinci’s Masterpiece pizza is better compared to Dong Juan’s All Meat Pizza because it tastes better and has more toppings. 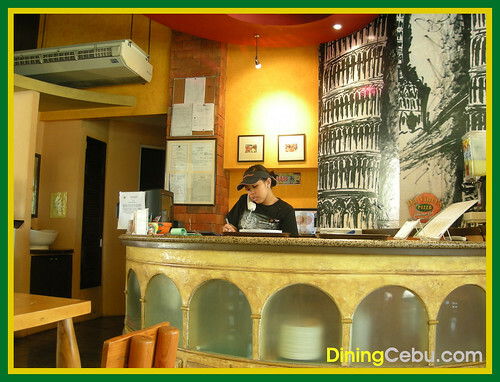 Da Vinci’s Pizza parlors in Cebu sets itself apart from the competition because they offer good quality and affordable thin crust pizzas. Da Vinci’s pizzas are truly a work of art! 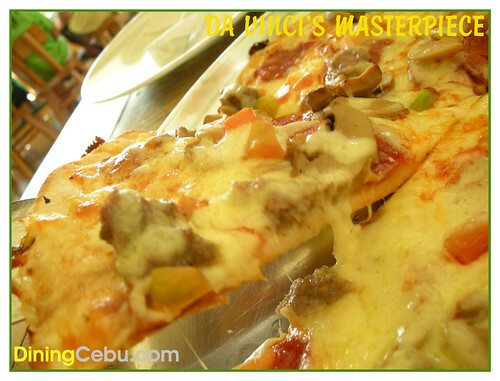 So the next time you’re looking for a pizza restaurant in Cebu, try Da Vinci’s Pizza. fedge, lami pud ang chicken garlic and shawarma nila. when i think of pizza, da vinci’s dayun na. price and product man gud. @jan: Thanks for visiting. We’ll try that one on our next Da Vinci’s food trip. Actually when I first tried Da Vinci’s in Osmeña, I was not that impressed, but that time in Mactan Marina Mall left a mark on my pizza library. Definitely value-for-money ang Da Vinci’s. my new pizza obsession: The Italian Job in Guadalupe. @jon: Yes that could be one factor. I’ll join you ha if you wanna go pizza hopping one of these days hehe… I haven’t tried Alberto’s and the one you were telling me about a 30″ pizza in “Calda” something. Da Vinci’s Pizza is absolutely taste good with reasonable prize! 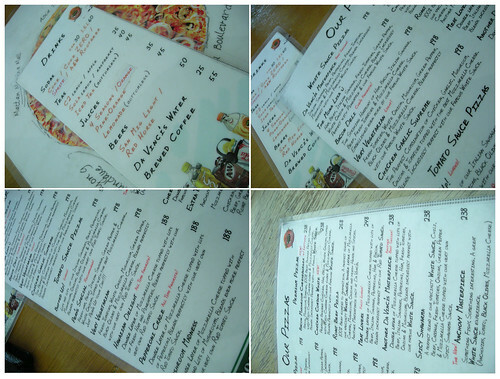 I tried their branch at Marina, Mactan just this afternoon with my friend. The food was really awesome but the service is not that good. Honestly, we were quite disappointed of how they treated us. 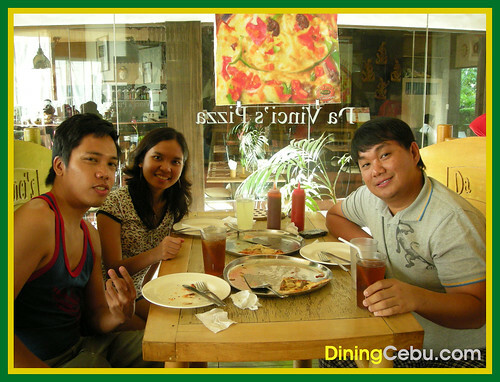 We just came from Crown Regency (Mactan) Gym and decided to have a quick snack at Mactan Marina branch, so we were just wearing shorts and sandals. Unfortunately, they treated us differently, but if you wear good clothes they serve you like a King but if you are wearing shorts and sandals – they treat you like a servant. It was such unpleasant experience. Sorry to hear about that Christian. Hopefully someone from Da Vinci’s will read your comment. Can you describe how they treated you exactly? But yeah, I do hope someone from Da Vinci Pizza will read this.